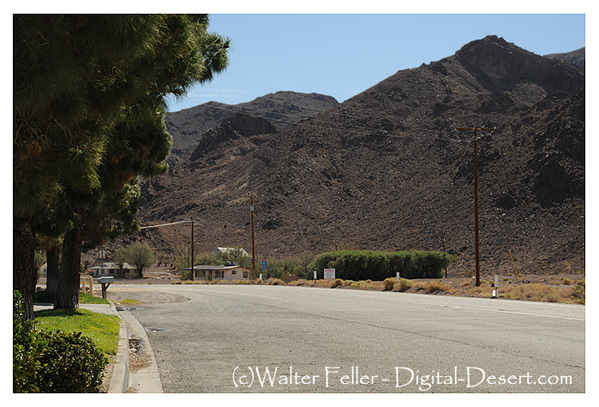 Newberry Springs is a community and railroad station 20 miles east-southeast of Barstow. On 19 February 1883 when the Southern Pacific Railroad was being built through here, the Watson post office was established at the railroad construction site at present Newberry Springs and discontinued on July 25 1883. The name Watson was for Josiah Watson, the first postmaster here. Meanwhile the railroad named their station Newberry and after the Watson post office closed this became the place name. On 11 March 1899 the post office was reestablished, named Newberry, and discontinued on 15 June 1899. On 12 October 1911 the name was changed to Wagner for Madge Wagner, a land owner, grocer, and the next postmistress. On 9 July 1919 the name was changed to Water. The name Water was given by the Sante Fe because an estimated 300,000 to 600,000 gallons of water per day were pumped for use by the railroad. 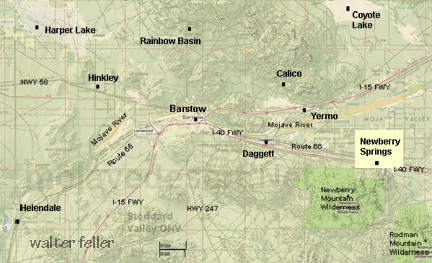 On 1 February 1967 it was changed to Newberry Springs. Newberry was named by the Southern Pacific in 1883. There is a story that two brothers named Newberry lived at the springs at what would later become the community of Newberry Springs. One of them was shot and killed during a fight over water rights and is buried at the top of a hill near the springs. A more plausible explanation of the name is that the area was named for Dr. J.S. Newberry, physician to the Lt. Joseph C. Ives expedition in 1857.